Mr. Lagerfeld, is this set "Hollywood via Paris"? What was the concept behind the collection? Behind the collection you see the rue Cambon building. It is the concept of Chanel today. A lot of movies have been made about Chanel. It is strange. She died over 30 years ago, and is suddenly again the center of attention. It was right to use the spirit and roots of Chanel to make something for today. 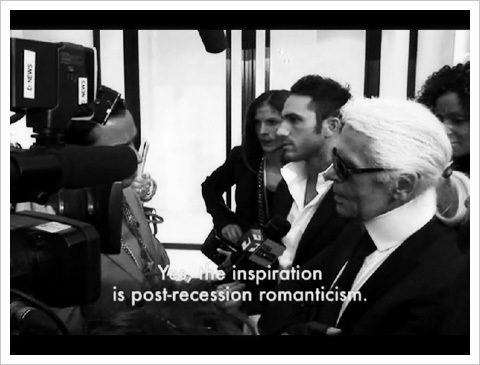 For people, this still holds the essence of Chanel. This is an optimistic collection. Were you feeling optimistic? Yes. the inspiration is post-recession romanticism. What inspired this collection? You have answered already, but give me another version. I don't have three thousand responses. Go ahead! Do your magic! It is my way of using the moods of Chanel to make new things. New proportions, new materials, a new spirit, new girls looks and attitudes. Then I put the details together. The collection is like puzzle. It would be mad to say, "This is only this". You cannot say, "I will do Egypt". and make everything Egyptian. It is a puzzle of millions of things put together to give the look of Chanel today. I love one of the simplest dresses, black and white. Beautiful. There were some very chic dresses. This dress came from nowhere. It was on my sketching pad. I showed it around, and I almost threw it away, because it was unrelated to the rest. But you saw the new belt like a bra. It is called a bra-belt. It is a real belt. You can open it. We have low waists, why not high waists? I wanted long, slim lines, which slide over the body. I accentuated the height with the hairstyles, in a mixture of tulle and feathers. It makes the women endless. I made these "French stockings" which veil the knees and give height. The calves are beautifully defined in the feathered high heels, so they can fly! It is give women wings. Beautiful work on the fabrics! The stocking are silicone ? There is an accent on graphic prints. Yes. It is a sort of dialogue running through the collection, with different silhouettes. The mini-jacket is a game of proportions? It is a fun way to lengthen the torso. Why does black and white still endure? Is anything better? Do you know a better combination? Black and white is the base of all the other colors. There is also grey and pink in the collection. This palette was inspired by Marie Laurencin's painting. Marie Laurencin was a friend of Chanel, she painted her portrait. Chanel hated it and never paid for it. She did not want it. Marie Laurencin always used colors in these shades of pale greys and off-whites, dusty colors. Never violent colors. It worked here with the paved streets of Paris. These are very Paris colors. Fire red is not Paris. The shopping bag with the name is wonderful! I cannot throw out shopping bags, even in paper. So I made one to last longer, in leather. No one has to buy it. But apparently people are dying for one! The fashion editors who saw them wanted one immediately. It is fun, a little wink. There is a real "rock and roll attitude"... All the musicians will be wanting this. I love music. Chanel had an affair with Stravinsky, I have one with the guitar. A poem says, "Things as they are are changed on the blue guitar". Chanel always made tiered dresses like this. She called it Gypsy, not flamenco. It is very Chanel. Look at the books of Edmonde Charles-Roux and you will see. She always varied her fabrics, but this is a look she often used from the '30s through the '50s. Always with different proportions, but it is part of Chanel. There is a study in fabrics, proportions and attitude. Chanel is life. It is the street, like here, but a certain type of street, It is for life, that is waht I find interesting. There was a nonchalance to the way the clothes were worn. Chic is only nonchalant. If it is stiff and not spontaneous, it does not work. Chanel took things from men, we give them back. She used the dinner jacket long before others, the gardenia, men's jewelry... Men had everything. She took the pants. She was the first, even though she hated jeans. It was a homage, for Chanel to give men back what she took from them. From all kinds of different boys, handsome boys. She had this love affair for life.